The UC San Diego women’s soccer team faced off against the Cal State San Marcos Cougars in the California Collegiate Athletics Association 2017 Soccer Championship semifinals on Friday, Nov. 3. The No. 1 seed Tritons went into the game at the top of their conference, holding a stellar 10–0–1 record. The Cougars finished fifth in the conference and advanced past No. 4 Chico State in the quarterfinals thanks to some penalty kicks. With five starters unable to play due to injury and illness, head coach Brian McManus called upon his reserves to deliver, starting a group of players who had never practiced or played together before. However, in spite of this hurdle, the Tritons successfully overcame their opponents, defeating Cal State San Marcos 1–0. The Tritons almost gave up a goal in the 63rd minute when Cougar senior forward Kayla Anderson pushed the ball downfield and chipped it over Triton redshirt sophomore goalkeeper Angelica Ramos. The ball sailed over Ramos’ head and bounded toward the goal. 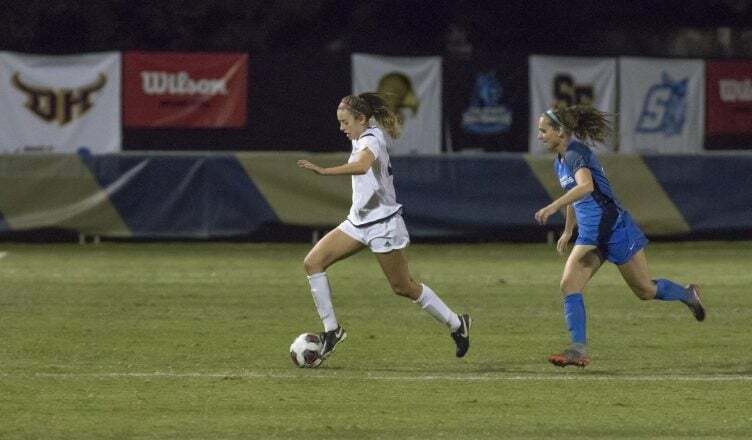 All hope seemed lost for the Tritons, but redshirt sophomore midfielder Natalie Saddic, who was named CCAA Defensive Player of the Year, had other ideas. In a burst of speed, Saddic dove for the ball and sent it flying away and out from the goal with a right-footed kick. UCSD’s lone goal came in the at the 67th minute of regulation when freshman forward Maddy Samilo, who was starting her first game with UCSD, received a left-footed cross by junior midfielder Summer Bales. Samilo sent the ball off the right post and into the net to give the Tritons the lead. With 2:30 left in the game, the Cougars unsuccessfully tried to make one last push for a goal. They got as far as the edge of the penalty box, but repeated stops by the Triton defense removed any last glimmer of hope remaining for the Cougars. A successful semifinal performance behind them, UC San Diego will play Sonoma State on Sunday, Nov. 5. UPDATE: UC San Diego defeated Sonoma State 4–3 in the finals to win its 11th CCAA championship.